It's starting to sound like we may have to get in line to catch a flying Uber. Airports are smelly, cramped, and filled with terrible waits. And forget about bus and train terminals — they’re barely better. But what if we could skip all that by pulling out our smartphone, hailing a flying Uber, and hopping on board, while laughing at the plebes back in line at security? We’ve gotten a pretty detailed look at what Uber wants its flying taxis to look like on Day One of Uber’s Elevate 2018 Summit. On Day Two, Uber invited six architecture firms to share their vision of what the future of flying taxi infrastructure could look like. And, you guessed it, it involves “skyports.” Which sound far sexier than they are. One notable vision came from architecture firm Corgan, which showed off its “Connect” infrastructure project. 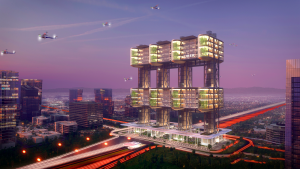 It’s essentially a vertical airport for up to 1,000 flying taxis that are capable of vertical take-off and landing (VTOLs). A single module could be plopped on top of the roof of a parking garage or high-rise, and features hubs for all of your shopping, business meeting, and restaurant needs. A single or multiple modules could be hooked up right to existing highways, connecting them to major arteries of a built-up city. So… kind of like an airport, then, minus the runways. Multiple modules could be combined to create one “Mega Skyport,” increasing capacity for both VTOLs and humans alike. But will it feature overnight parking? Or do I have to take an Uber, to grab an Uber, to grab an Uber? Where’s that “pull out your smartphone, and hail a flying taxi” future we were promised? Getting in a car, to get on a highway, to park, and then to hop on a flying taxi sounds like a lot more effort than truly liberating flying features. To get closer to a fully decentralized, road-network-style flying taxi solution, modules would have to be fairly spread out — a tall order, given how cramped most cities are becoming. And getting real estate moguls to hop on board and allow their rooftops to be taken over? Probably gonna require quite a bit of extra convincing. 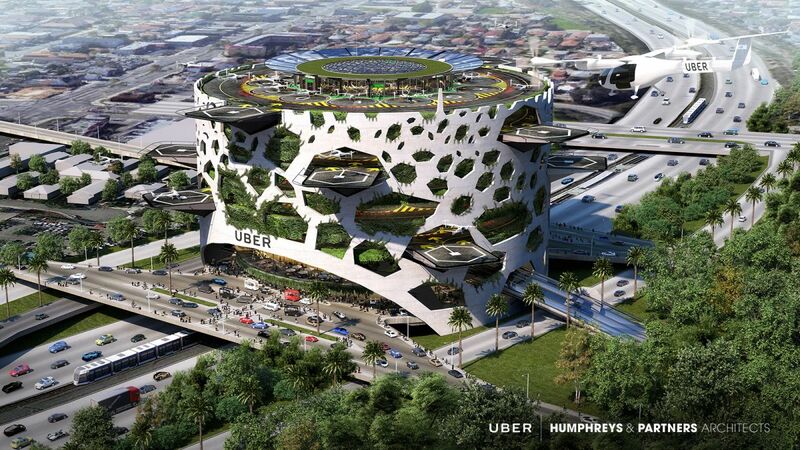 These renders may look incredibly futuristic, and distractingly beautiful, but if it turns out that “mega skyports” are the only way to catch a flying Uber, their future might be doomed to mediocrity right from the start. Here’s hoping Uber streamlines the sky in their next stab at this.